The composite photograph shows in the bottom the pair on display in New York. The top comes from the (seized) archive of a dealer unlisted in Art of the Ancient World XII (2001). Indeed the top photograph clearly predates 2001. 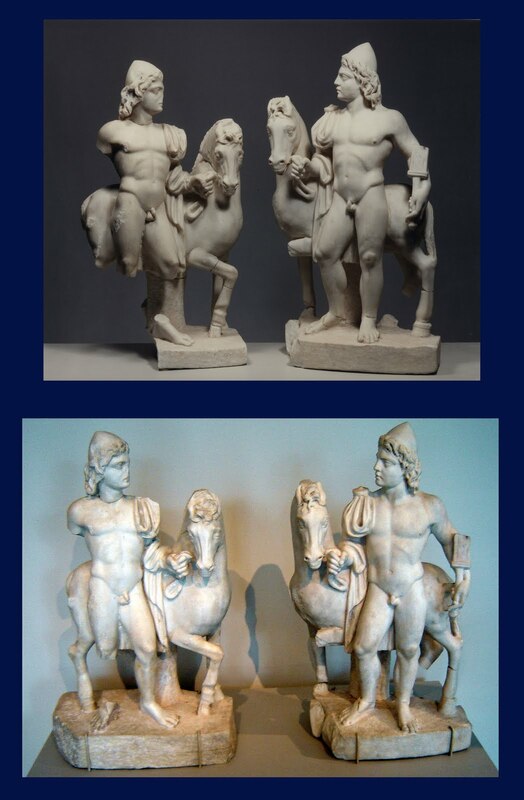 Is the Met aware of the full collecting history of the statues? How rigorous was its due diligence search prior to accepting the loan? How reliable is the suggestion that the pair once resided in a Lebanese private collection? Has any part of the "published" collecting history been fabricated? Is there any any reason to believe that the pieces were found in the Mithraeum at Sidon? Indeed were they even found in the Lebanon? Did they first surface in the nineteenth century? There is a serious point here. The statues are being presented as "probably" coming from a specific location (a Mithraeum) at a specific location (Sidon). If this is true - if - then what does this say about the worship of Mithras in the Near East? But what if, hypothetically, the pair had been found in a temple of (say) the Syrian Goddess further to the east? How would this change the way that we view and interpret the statues? I am still hopeful that I will receive an answer to my question. What is the basis for saying that these statues once resided in a Lebanese private collection prior to the 1950s?